Cuttack – a city of 52 markets and 53 streets is one of the twin cities of Odisha (the other being Bhubaneshwar). Cuttack is also the second largest city in eastern Odisha. 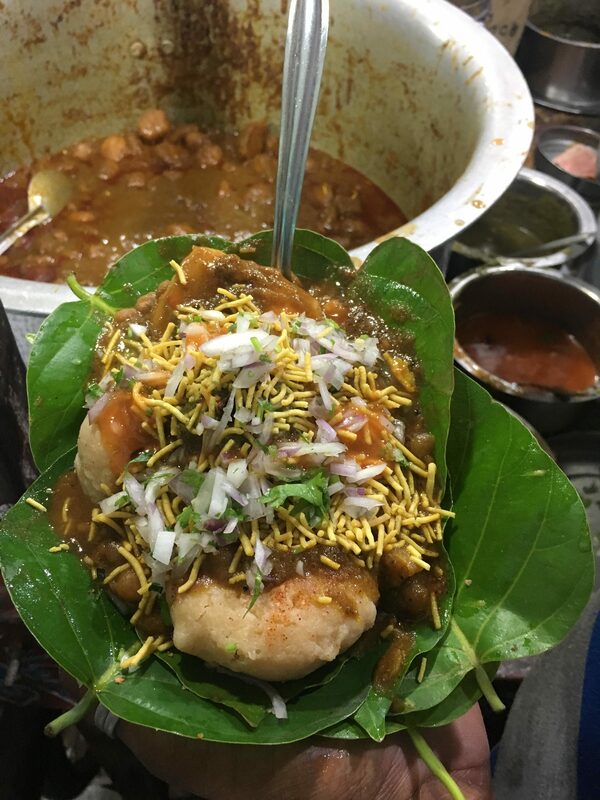 Recently, I went on a food exploration in eastern Odisha covering 4 cities – Cuttack, Bhubaneshwar, Berhampur and Puri. Cuttack should be known as the land of aloo dum dahi bara. A plethora of dahi bara stalls can be spotted everywhere. Dahi (yoghurt) and Bara (lentil dumplings) are served with a thick potato curry, a startlingly unique combination if we compare it to the northern style dahi bhallas. The baras are served soaked in a thin runny chaas (buttermilk) kind of dahi, tempered with spices. 4-6 pieces are put in a dona and topped with aloo dum. The exact preparation varies from stall to stall. The timings of the stall also change from one vendor to vendor. 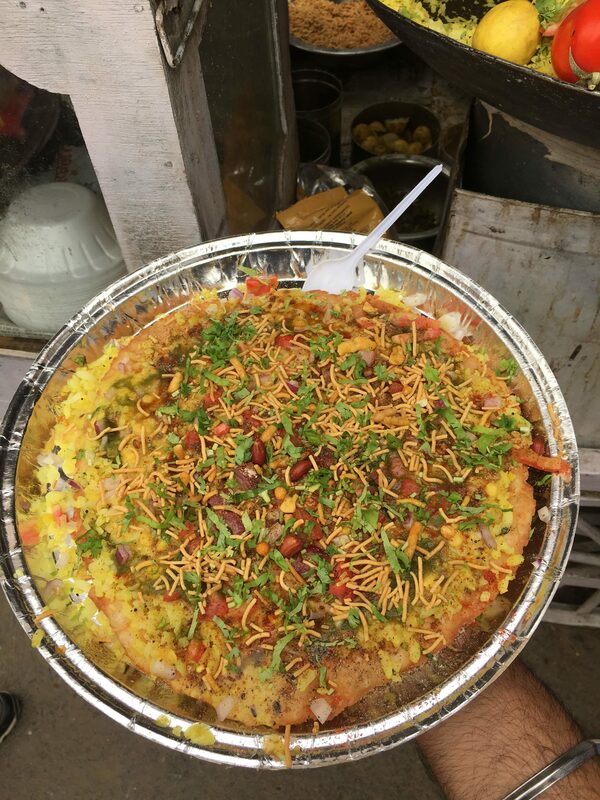 The most popular dahi bara stall is Raghu’s Stall- a 45 years old shop in bidanasi. The baras are served with aloo dum, sprinkled with red chillies and salt. Even though slightly spicy for some, they also sell cuttack peda at the next counter in case the spices get you in a hustle. Raghu comes every day and sits at the corner to oversee the preparation. It is so popular that they are sold out within one hour from 5 pm to 6 pm. Next, we went to Trinath Dai Bara shop. The baras here were topped with thick and super spicy aloo dum, ghugni, sew, onion, sweet and spicy chutney. It was delectable, with the pinch of spice. This was the only place in the whole of Odisha where I had hiccups after having his dona of dahi baras. We also tried the dahi bara at Puniya, available only in the mornings– served Raghu style but comparatively less spicy, and Eshwar dahi bara at Biju Patnaik Chowk. My personal favourite was Eshwar dahi bara because of two reasons. First, Eshwar was the most humble person whom I met in Odisha. 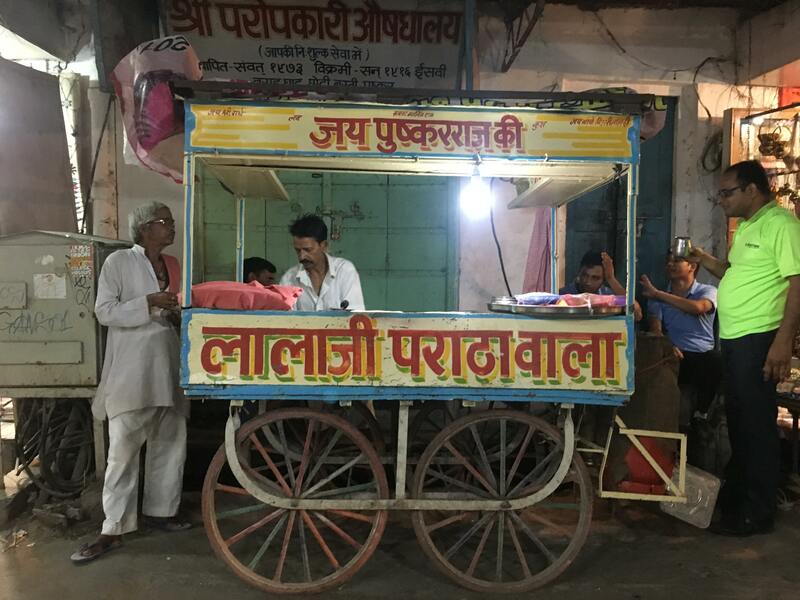 He started selling dahi bara at the age of 13 on a cycle and now owns a cart. Second, the dahi bara was spiced perfectly. He also adds a sweet bara with the salty one and tops it with aloo dum, ghugni, sew, onion, chutney. I loved the preparation and the love and warmth with which he serves his customers. Dahi sharbat and rabdi sharbat are the two most popular beverages of Cuttack. The process of making them is quite simple, but the preparation is exquisite when finished. 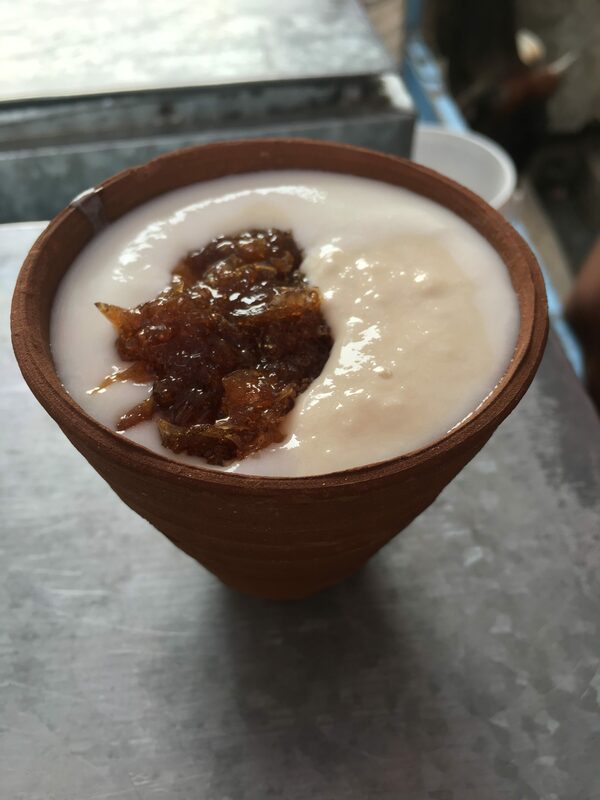 At Sen and Sen shop (near chandi mandir), which is 50 years old- sugar syrup, yogurt, grated coconut and rabri are layered and the essence of pineapple and jamun is added as a finishing touch. They are not mixed together. Small pieces of ice can be tasted in between while you drink the sherbet. 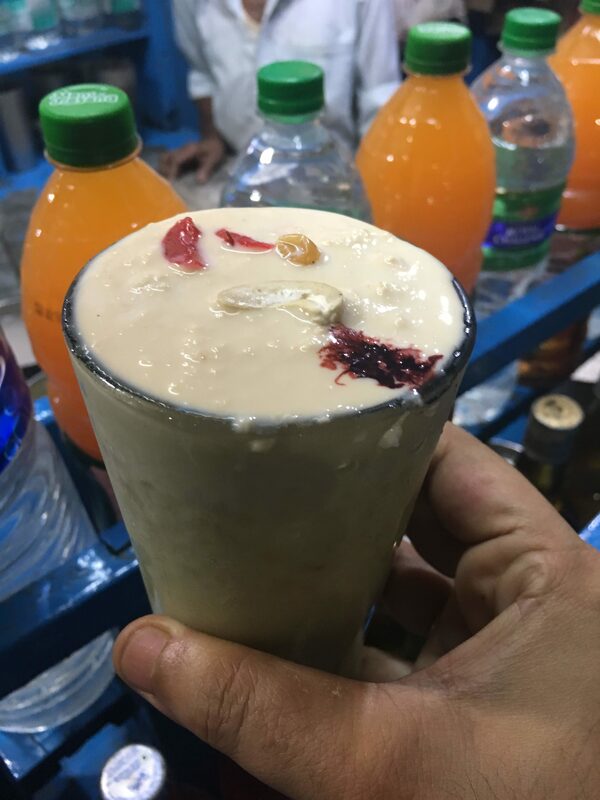 At Dil Bahar sherbet shop in Baxi bazar, they blend the mixture with ice completely and top it with essence of pineapple, jamun and small pieces of cashew. I like the one at Dil Bahar because everything was blended together with the shaved ice. The preparation style of chai and taste changes from one region in India to another. In Odisha, the chai is pre-made at most of the street side chai stalls. On one big giant pot, the tea is brought to a boil, with all the spices and some thick omfed milk. Then, in a smaller pot the chai is strained and served. The chai is thick and delicious. At Monu tea stall in baliyatra padia, the warm hearted owner adds ghee in the tea. Known as gua ghee tea, it tastes good. The tea shop is very popular during baliyatra. Mausi chakuli shop in Nandi Shahi is a hot spot for breakfast in Cuttack. 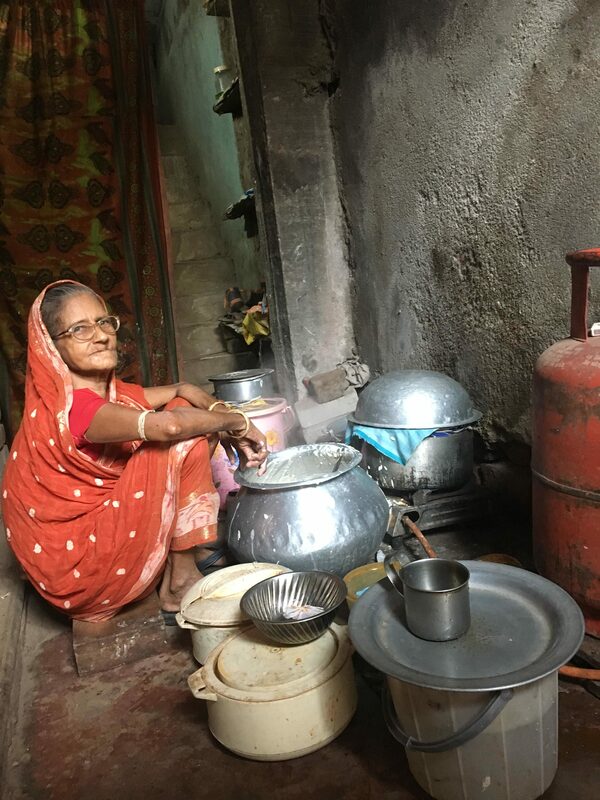 76 years old, Annapurna Devi runs a morning breakfast dish- chakuli with red hot spicy chutney. She wakes up at 4:30 am, does all the preparation and sets up her shop at the narrow entrance of her house. The steamed fresh chakulis are cooked in a traditional way with the batter spread over a piece of cloth on a boiling pot. The batter of the chakuli is made with rice and white lentils (biri). It’s a close cousin of dosa and idli. At Mausi chakuli shop, the chakulis are served with spicy red garlic chutney. This was one of my best experiences in Cuttack. It was again more of the warmth and affection of Annapurna Devi that made the dish and the whole experience special for me. Naya Sadak is a hotspot for breakfast in Cuttack. The food carts sell chakuli with ghugni (chickpeas), coconut chutney and red chilly chutney. One can top it with pyaazi- onion fritters. The interesting part is that the plates have to be washed on your own. For evening snacks, Kalia chops and babu bhai chops shop in Professor Pada are widely known. Kalia and Babu bhai, both are bothers and run the chop shops adjacent to each other. Both of them sell prawn, liver, mutton, and chicken chops. At babu bhai’s junction, the devilled egg was excellent. The boiled eggs were filled with minced meat, wrapped in mashed potatoes and covered with powdered biscuits. 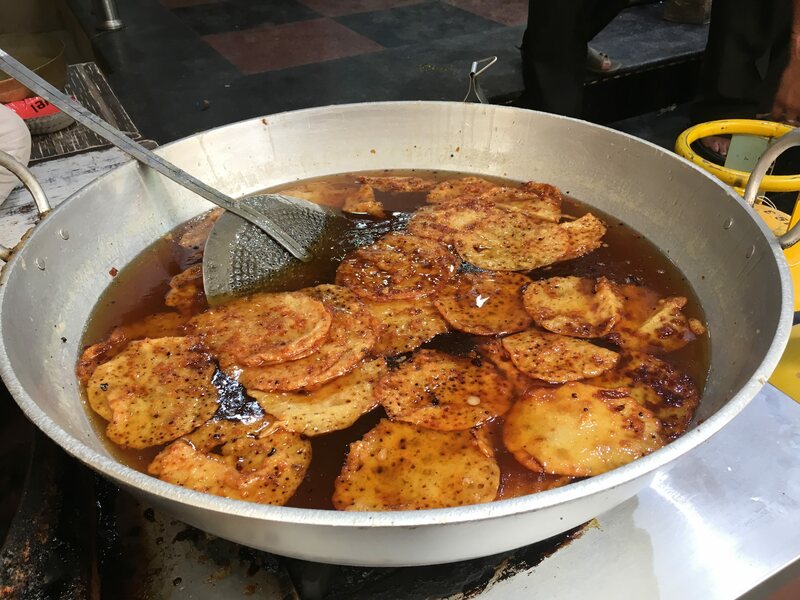 The chops are deep fried in oil and served crisp with chilly and tomoto chutney. The last stop in Cuttack was biryani at Girija Hotel. The biryani is served with runny onion and tomato raita. Cuttack style biryani is a mix of Awadhi and hyderabadi style. It is light on the spices with a hint of kewra, layered, and cooked on dum. The other landmarks on Cuttack-Bhubneshwar highway are Nana hotel, Phulnakhra and Pahala. Nana means elder brother in Odisha. Famous for their mutton curry with rice, the typical dhaba style set up is enticing at nana hotel. The food is served on an eco friendly dried leaf. A plate of mutton curry and rice costs INR 120. This was my next favourite meal in Odisha. I loved the spice level, soft and succulent pieces of mutton, and not so thick mutton gravy. There are two variants or rice available here- Usna and Arwa. Based on the taste preference, one can opt for any of them. We also tried mutton at Nanda hotel. Nanda Hotel’s mutton curry is full of fat and a layer of fatty oil can be seen floating on the top. Even though tasty, Nana Hotel wins this round for their delicious mutton! Not far from cuttack is a landmark in Indian sweets history- Pahala, known for rosgullas. I am sure everyone in North India would have grown up eating thande thande rasgulle. But here the rasgullas were warm and fresh, straight coming out of the boiling chashni. I loved it to the core. The step by step preparation of rosgullas was interesting to observe. To prepare the dough, chhena (cottage cheese) is mixed with suji (semolina) in the ratio of 1 kg of chhena to 50 gms of suji. After the dough is kneaded, it is filled with khoya or dry nuts and boiled in sugar syrup on a wooden fire. The piping hot rosgulla has different colours based on the hours of boiling. The ones that are boiled for longer duration are brown in colour and the others are white. The rasgullas were super soft and not extravagantly sweet. The syrup was thin. 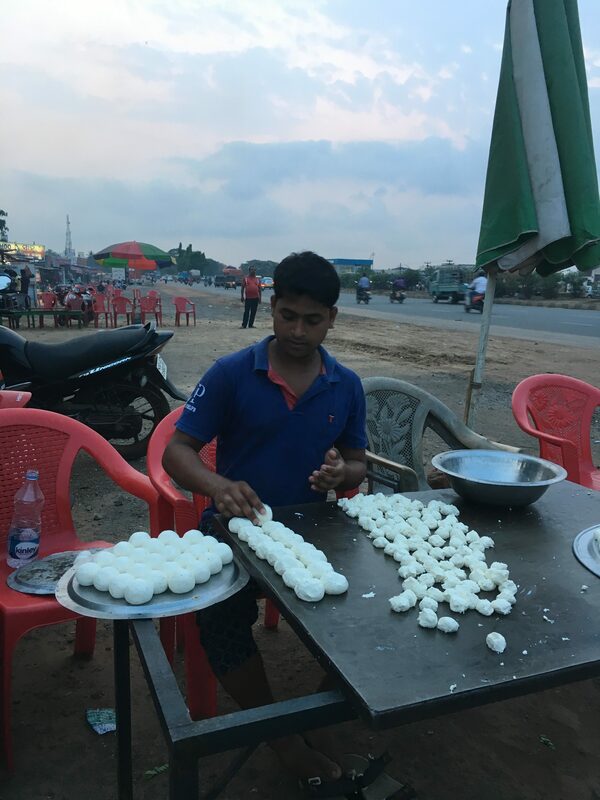 There is another variant of rasgulla in Odisha of Salepur. Half an hour journey from Cuttack is a town called Salepur famous for Bikalananda Kar’s rosgulla. Kar’s rasgulla were brown in colour, and sugar syrup was thick. I met the second generation owner, Mr Pramod kar who showed me the processing unit of the rosgulla. They are quite mechanised and use the standard assembly line of production. Electric boilers are used for making the rosgullas of different sizes. Based on the size, the price is fixed, ranging from Rs 5 to Rs 25. Rosgulla’s costing Rs 25 are quite big in size and have cashews in them. At the entrance itself, pots of rosgullas are lined up with each having a different size of the sweet delicacy. A taste of this ‘hatke’ style of rosgulla was indeed the experience of a lifetime!